As most people are aware, the relationship between the settlers and the original inhabitants of my adopted country has often been, shall we say, far from ideal (some would say that little has changed…). When the British claimed the continent for the crown, they declared it Terra Nullius (Latin for ‘land belonging to no-one’), conveniently ignoring the Aborignal tribes who had been living there for tens of thousands of years. In many cases, this clash of cultures resulted in imprisonment, de facto slavery and (in at least one case) virtual extermination. 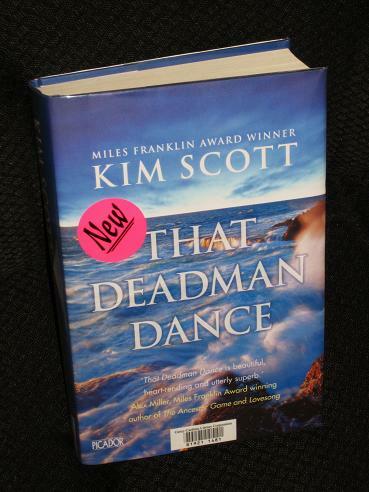 Kim Scott’s novel That Deadman Dance attempts to show that this (like so many other things) happened slightly differently over in the West. Set on the southern coast of Western Australia in the 1830s/1840s, this year’s Miles Franklin Award winner depicts an intriguing slice of Australian history, a period when colonists and natives coexisted in relative harmony. Scott has Aboriginal ancestry, and his story incorporates members of his family, from the Noongar people, and actual events of the period, using history as the base for his tale. The novel revolves around Bobby Wabalanginy, whom we first meet as a daring young boy, dreaming of women and whales. When British colonists arrive to establish a make-shift settlement, the leader of the expedition, Dr. Cross, takes a shine to Bobby’s adoptive father, Wunyeran, and the two men become friends. The Aborigine starts to learn English, visiting the main settlement and experiencing the thrill of travelling across the ocean waves, while Cross starts to learn about the Noongar, hoping to set an example of cooperation which will spread to other settlements in the colony. As the story progresses, however, these initial promising beginnings are tested. When the job of keeping the relationship alive and strong passes on to the next generation, it soon becomes clear that the balance of power has shifted – where the uncomfortable colonists were initially outnumbered by the Noongar, the settlement eventually grows, just as the indigenous numbers begin to dwindle. Once this happens, the spirit of equal claims to the land is almost doomed to failure. The charismatic Bobby, singer, dancer and linguist, is a member of the generation growing up throughout this period of change, still living with his people but able to pick up enough English to make himself very useful to the settlers. His experiences mirror those of his people, at first indispensable, then grudgingly tolerated, later expected to conform to the new cultural norms, imported from beyond the horizon. Bobby wants to believe in the newcomers (from whom he received his new name), hoping to straddle the divide between the two worlds, and he continues with this until the end, long after many people (on both sides) have given up the pretence of mutual respect. While I enjoyed the book, I must confess that it didn’t impress me as much as you would expect from a book which took out Australia’s top literary prize. It dragged a little for me, and the lack of any real plot, other than the main idea of the change in fortunes of the two groups, left me feeling that there was something missing. However, That Deadman Dance is an entertaining novel and extremely fascinating from a cultural point of view. The reader is shown how the lack of understanding between the two groups repeatedly complicates their efforts to get along. The Noongar constantly expect the new arrivals to be leaving again, regarding them as guests, albeit ones who may be stretching their welcome a little. The settlers become annoyed that the natives constantly beg (or steal) food, not realising that they themselves are doing the same when they hunt kangaroos and dig up wild vegetables. Even friendships like that of Cross and Wunyeran are unable to paper over the cracks of ethnic differences. I'm sorry to hear that this didn't impress you as much as you expected. The rave reviews persuaded me to import a copy (at great expense :-() and so this is top of my TBR at the moment. I hope I enjoy it more than you did. I have this sitting on my shelf to get to at some point! The last Miles Franklin winner I tried to read was Carpentaria which I couldn't finish, so I am hoping this one will be different! Marg – I've had a few good ones with 'Breath', 'Dirt Music' and 'The Time We Have Taken', so I have very high expectations 😉 This is enjoyable and easy to read for literary fiction (if that makes you feel better!). Sounds like it would be a great book, if you wanted to understand Aussie history, culture etc. but just missed the mark as a novel. Shame as the premise sounds good. Well don't write it off completely 🙂 I get the feeling that I may be in a minority here – I'll be interested to see what other people have said about this one. PS Is it possible to enable subscribing by email on your blog, Tony? As for the e-mail thing, done! Oh good, cos I prefer subscribing by email too so now I can check on you more easily … though I had put you as a gadget on my iGoogle to watch you! Anyhow, it sounds like I liked it more than you did too. My reading group was generally very positive. Two, though, didn't like it at all. The rest of us all liked it a lot though most of us did find it a bit slow in the middle and some thought all the detail about whaling wasn't necessary. I could see what they were saying – and it was slow in the middle – but I didn't mind that. I liked the writing and description so much. I think that sums it up nicely. For me, there was a little too much of the whaling etc, and it did drag in the middle.